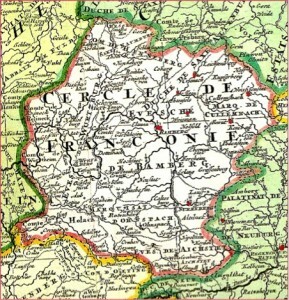 Charlemagne, King of the Franks, promoted the cultivation of wine in Franconia. In the oldest surviving German royal charter he gave a Franconian crown estate, including eight vineyards, to a convent in Fulda. Wine cultivation expands to 40,000 hectares and Franconia becomes the largest area of wine cultivation in the German states. Wine becomes the national beverage. Through the destruction of the 30 years war, only vineyards in the core areas of the Franconian wine region are able to recover. In addition, climate changes deteriorate growing conditions and beer becomes the prevalent beverage. Resurgence of “Frankenwein” as it develops into a fashionable drink. Advocates such as the famous playwright & poet Johann Wolfgang von Goethe, born in Frankfurt am Main, write about no other wine matching it. Landowners promote the planting of vines in an area that eventually covers 16,000 hectares. 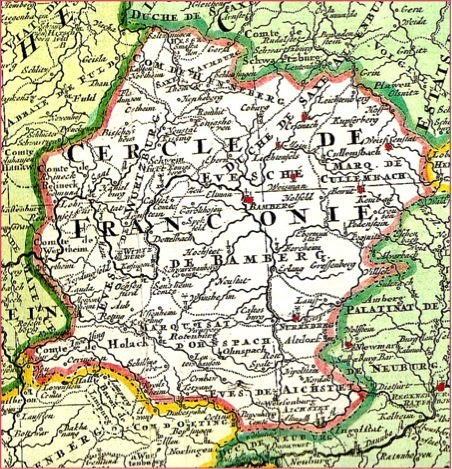 Secularisation causes the second large demise of Franconian wine as many vineyards were in monastic hands. The rise of Napoleon spread the influence of French wine. Cultivation dropped to 10,000 hectares. The process of industrialisation led to increased flight from the countryside and a third demise of production. Only 2,500 hectares of vineyard remain. Quality of product is poor. Reconstruction aided by land reform, advice & support for Franconia’s producers. Focus is on quality rather than quantity & yields are restricted to 60 hektolitres per hectare in a total of 6,000 hectares of vines.